The folks at Pixar have created a new Toy Story Short that will actually be ahead of The Muppets and is called Small Fry. This is the second short Pixar has released and the last one was Hawaiian Vacation that appeared ahead of Cars 2. We are big fans of the Toy Story series and know many of you are big fans of both Toy Story and The Muppets, so we are pretty sure this will be a good treat before the movie. Synopsis: "Blame it all on toy envy as a Happy Meal-type toy at a fast-food restaurant yearns to break out of his glass display case to play just like a real toy. He kidnaps Buzz Lightyear in an attempt to take over his play-filled existence... 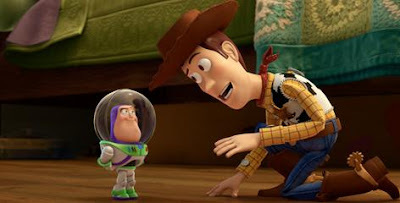 The life-reversal forces the real Buzz Lightyear, voiced by Tim Allen, to deal with a support group for discarded, unloved fast-food toys."